During the course of our NGO site visits, the group observed a sequence of amazingly productive organizations working in Tamil Nadu, South India. 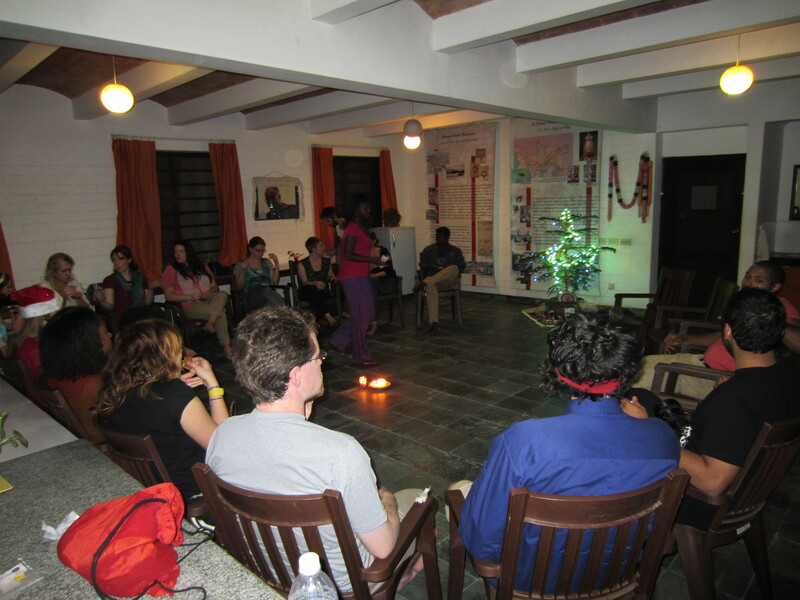 From areas encompassing sustainable forestry and organic farming to village empowerment projects working mainly with the untouchable community, women and children, I felt each organization had something extremely valuable to offer through a two week internship during my brief stay in Auroville. This one special children’s home, however, left a lasting imprint and I was instantly moved to work and become a part of “Melquie’s” beloved SALT. My first encounter with the home ironically took place in the evening, the first impression enveloped with the unpreventable darkness of rural India night sky. The sun collapsing behind a gold encrusted Tamil horizon, it was not long before I would need to remove my pink colored headlamp from my handbag as its replacement to comfortably move around the property. As we sauntered through the rooms I began to notice the house was merely a skeleton for these orphaned twenty-five boys, a place very different from the home in which I was raised back in Texas. Rickety shelves here and there with random small piles of children’s belongings upon them – clothes, books, and a few toys stacked in a disheveled manner. The walls were bare and without paint, made of cement and chipped in various places of every room. The floors even barer if this could be possible. As I saw no beds, blankets, or pillows I realized the boys were using torn straw mats for sleeping on the cold cement floors of the home. 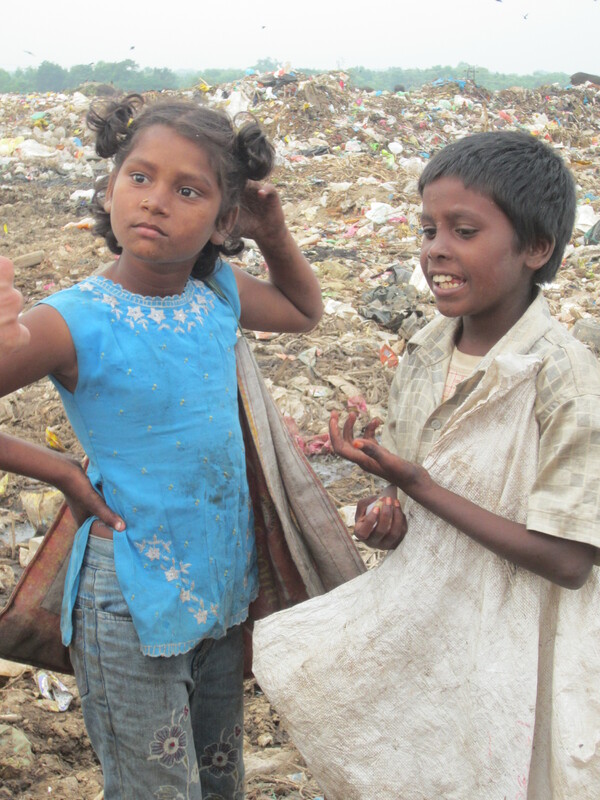 The director, a charismatic middle-aged single man, introduced himself as the father to each of these children. I have never felt so much love by one man for a cause. Some of the children dashed and darted with obvious excitement among members of the group as we walked within the home, others stood and observed intently, huge glowing smiles upon each of their faces. I couldn’t help but smile back at them. Wile we may not have the hope of anything close to a white Christmas or a Christmas tree, we do have sweeping vistas of the Indian Ocean’s warm waters lapping sandy shores and busy country roads endlessly dotted with rows of coconut groves and brightly colored houses in fuchsia and electric orange. All things considered, and after you’ve heavily sprayed yourself with DEET to ward off the local mosquito population, this isn’t a bad way to spend Christmas. Hurtling down the dirt country roads by Moped, dodging cows, dogs and sari-clad women carrying bundles of wood for the evening cooking fires, the sun begins to set here on Christmas Eve in Auroville, India and while it may seem worlds from what we’re used to, Christmas is still found here. 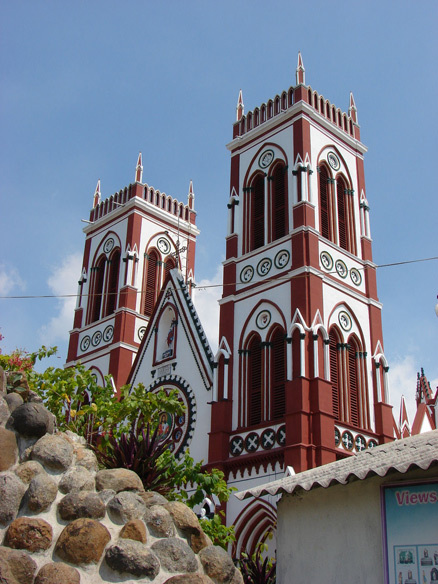 Few Indians, though colonized by the British and the French —as in the case of Pondicherry and its surrounding areas —have converted to Christianity (roughly 3 percent to 6 percent of the country’s population identifies themselves as Christian or about 24 million people), according to information by the U.S. State Department. Instead, the majority prefer to keep their local heritage and religions alive through Hinduism, predominately. Despite this, or perhaps because of this, Christmas is readily found in India, be it a curiosity, a symbol of the other or simply just a way to drive sales as tourist season picks up. In India sale signs and gleeful Santa Clauses are still found waving in front stores downtown and local tradesmen are producing their wares in bulk to accommodate the tourists. While we may be limited in our decoration colors, predominately red, white and green, Christmas in India is as colorful as the silk saris worn by the women here. Even the ornamentation of Sacred Heart Church’s nativity and building in the city of Pondicherry are dripping in colors rarely seen outside the tropics. Pint-sized Santa costume...no problem fitting down the chimney here! 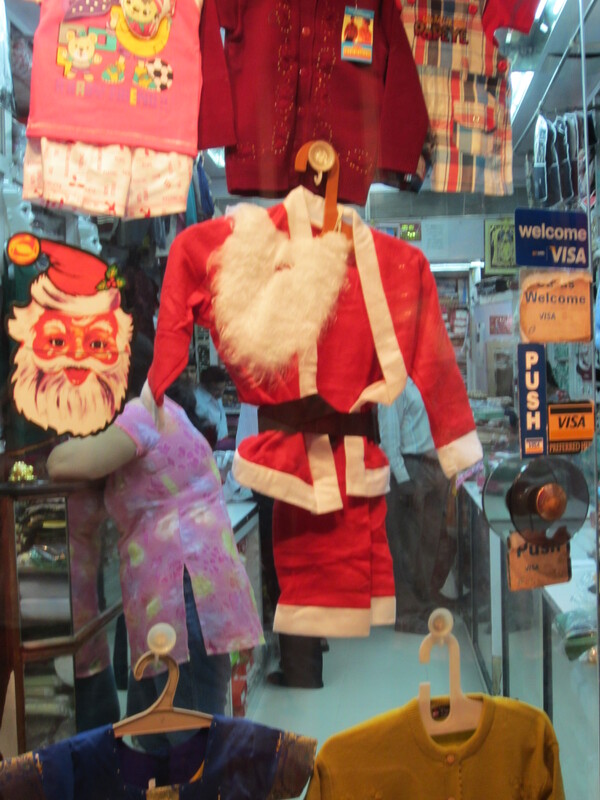 But it goes further than just the decoration of Christmas and the child-sized Santa Claus outfits, displayed in every other window of side street shops. 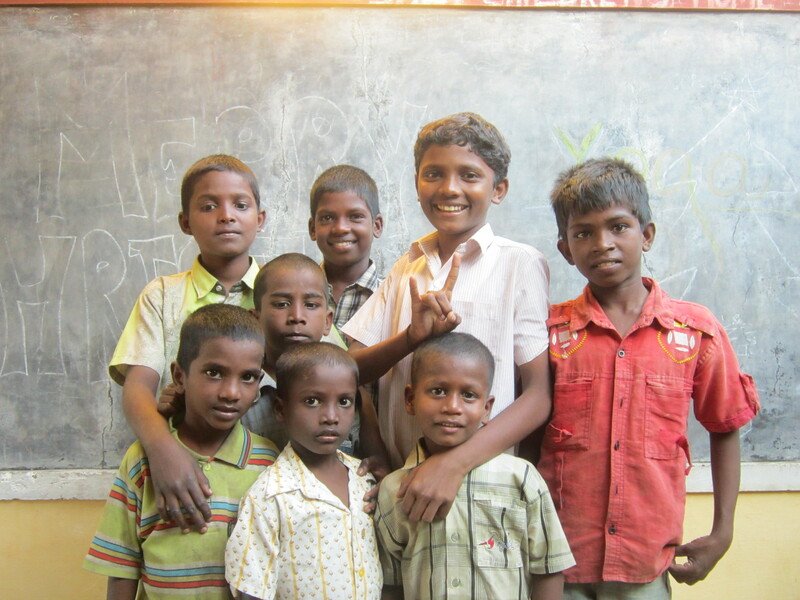 Education about their past, their present and their future is also important in the cities and among the villages that had been colonized and today, lay so near to the international township of Auroville. As an expression of human society and development Auroville attracts people from all walks of life, religions and cultures throughout the world, said Nick Klotz, an Australian living in India and a volunteer at the Mohanam Cultural Center in the village of Sanjeevi Nagar that hosted a morning Christmas event and play about Jesus. Poster for Christmas at the community center. The children’s play focused on Jesus’ trial and crucifixion, so it was more about the Easter story of Jesus rather than his birth but it provides context for the children as to why this figure is so important to the others that live in the area. 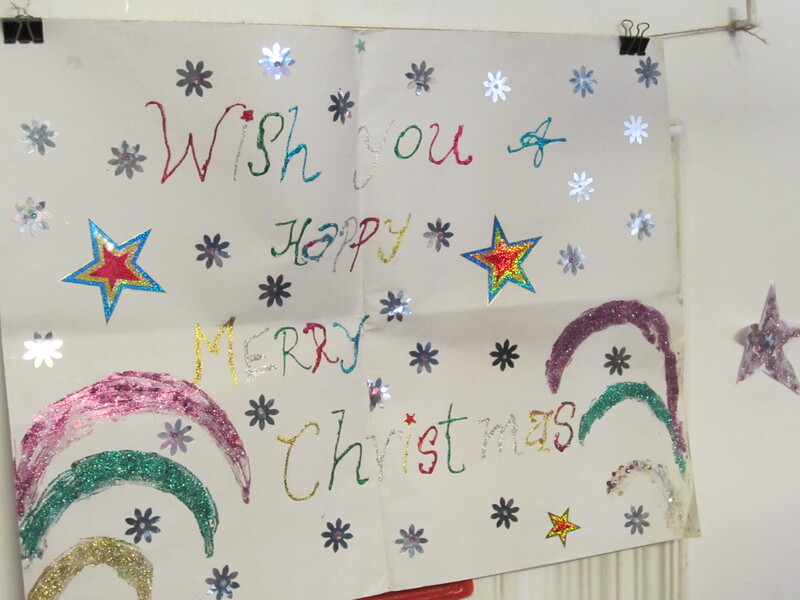 They also sang Christmas carols and decorated crafts. Many of us share in this same type of education around the world, this cross cultural exchange of knowledge, spirit and culture that helps us better understand our place in the world and how others fit with us. It is a privilege to watch the celebration of something so foreign to this culture and watch how it fits into their perspective. Watching the sun sink below the tree line of thick palms, the sky illuminates with lavender and bright orange. The smell of coconut, saffron, jasmine and curried spices fill the air, instead of the smells emanating from the family turkey, Christmas cookies and homemade pies. 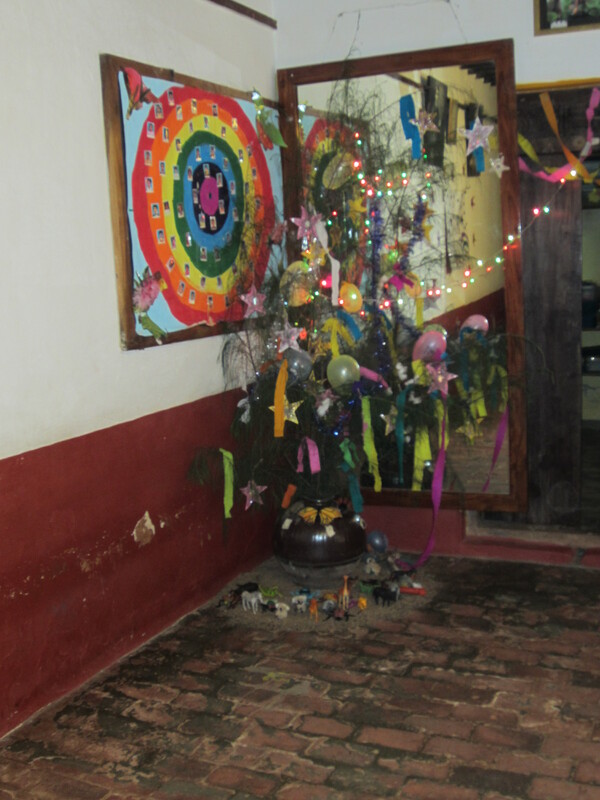 While many of our families were waking and preparing for guests, we celebrated our Christmas Eve beside a lovely tree decorated by the residents here at the Tibetan Pavilion in Auroville, replete with shimmering lights, and of course, packages under the tree for our White Elephant gift exchange. For me, the sounds of Christmas in India will come back to Paris with me in the form of Baul ‘n’ Beyond a greatest hits compilation, which I’m sure will get plenty of use now and for many years to come. From India, what we wish for our friends, family and patrons of this blog is a wonderful holiday filled with treasured memories for years to come. Merry Christmas! Upon arriving in Chennai from our long (long!) plane ride from Paris, we piled into a bus heading into Mamallapuram. As the sun was rising, I was way too excited to sleep on the bus so I gazed forward out the window towards all the Indian country had to offer me. Like a child, I turned to my friend Madeline, excitedly pointing and shouting “A cow! A cow!” She quickly responded “Where? I don’t see any cow!” (I have to admit I was a bit worried that I may have started to hallucinate from Malaria pills or lack of sleep!) But as the big orange sun continued to rise over the Indian horizon, I started seeing more of them (real cows, not hallucinations). And as I looked closer I began to notice that the cows weren’t marked in any way. 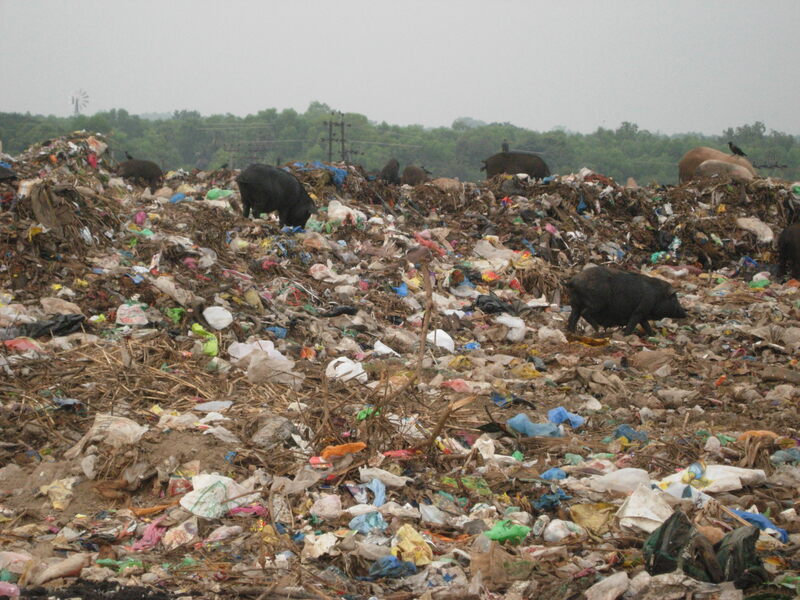 I had heard about the sanctity of cows in India but I wasn’t exactly sure how they functioned in everyday society. Were the cows wild? Did they belong to someone? Why were they loose in the street? I didn’t see any kind of brands on these cattle, nor colored ropes or markings of any kind. I turned to our unofficial guide and local Aurovillian, Perumal, and asked him how people knew which cow was theirs. He promptly replied, “Well, you know your cow like you know your kid”. He told me that during the day, people let their cows roam free in the village and use their milk to drink and manure mixed with hay to create floors in homes. When cows become too old to produce milk they are turned out and allowed to wander through the streets, living out their last days in peace. Coming from Texas, I am familiar with people owning a couple hundred head of cattle at a time, and meticulously making sure each one is branded with the ranch’s symbol. In my mind, all cows looked alike and I would have never thought that a person would equate the knowledge of their cow to that of their child. This was the beginning of a series of realizations and understandings that I’ve had in just these first few days. It is amazing to learn about differences and similarities between my home culture and this one. Coming from a small town in West Texas, I saw Paris as “exotic”, never thinking I would ever have the opportunity to visit India! The more time I spend here in Auroville and the surrounding villages, the more I begin to understand (or at least try to understand) their way of life. Today we had an especially interesting presentation given by Ribhu Vohra from Soma Waste Management, who explained some obstacles faced by his waste management initiatives. He described the dangers of both burning the trash (releasing toxic fumes into the air) and dumping trash in the street (contaminating the drinking water and attracting insects). He explained that people often are just not motivated to pick-up the trash, and when asked to recycle they simply don’t have the time or energy. 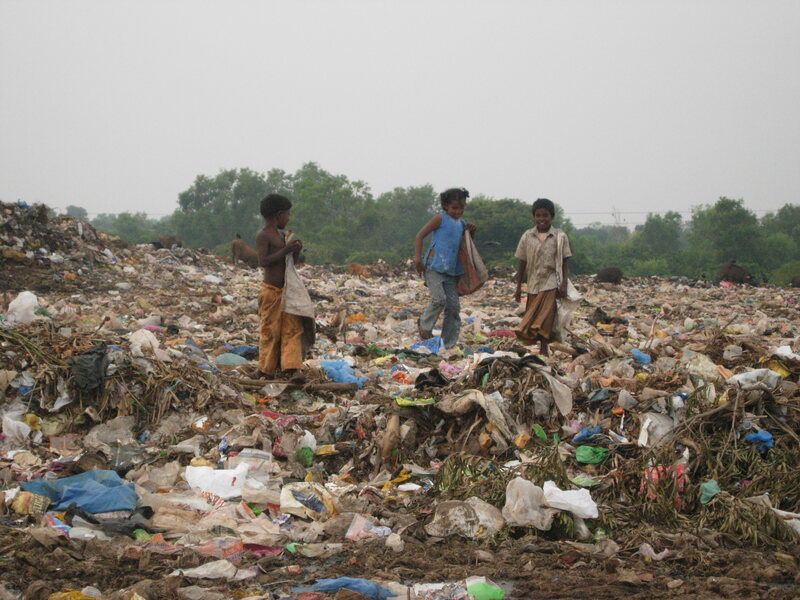 One interesting solution to this problem that was suggested was the idea of hiring adolescents to ride bicycles around the villages, giving cash for recyclables on the spot. By going door-to-door, the women would simply have to hand over their plastics and metals to the boys, who would then pay the women in cash. Although recycled bottles and milk cartons don’t bring in an abundance of income, these women have the opportunity to possibly make enough money to pay for a meal for their family by simply separating their waste. This is just the tip of the iceberg of one of the many sustainable practices that I’ve come into contact with here, and it’s only day seven! I can’t wait to learn more about these exciting initiatives and how I can get involved to help! This used to be a cashew plantation, I thought to myself, staring at the tall forest around me. If I hadn’t been told that, I would have never known. Standing in the middle of the Evergreen Forest in Auroville, I paused to glance around me. Trees towered above my head, leaves carpeted the ground around my feet, a woman sat reading in one of the open-air guest houses; I was a far cry from the busy city life of my familiar Paris, a city where I had begun to feel quite stagnant in life. I inhaled deeply and smiled; the fresh air seemed to begin my personal renewal. Though Sasha’s remark was simple, it struck me as more profound than an unassuming observation on the future of the forest. Yes, the forest needed to be managed properly to reinstate the indigenous tropical evergreen forest in an area that hadn’t seen such vegetation in years. As our forestry expert Dave said, trees had to be planted and thinned, biomass had to be encouraged, and careful watering schemes had to be implemented in order for healthy forest growth and development to occur. But perhaps Sasha’s statement went a bit deeper. Sasha meant to describe the evergreen forest but had also inadvertently defined the purpose of every individual in the practicum. While we’re here to give back to the community, we’re also here to grow personally. Every person we meet in India contributes another piece to our life landscape and teaches us a lesson. Every experience deepens our understanding of the world and brings us closer to the purpose we’re meant to fulfill. Our own growth is vitally important to our lifelong individual sustainability. Personal planting, growth, pruning and change allow the growth necessary to create meaningful and sustainable lives. My wish is that each of us can grow from this experience in a way where if someone were to hear our life story, he would think, That person used to be very different, but if I hadn’t been told that, I would have never known. One of the first photos I took upon arriving in India was of a brick wall opposite the thousand year old temples and bas relief of Mamallapuram. I took it because it recalled a topic I’d researched this summer as part of a course called Visual Practices of the Urban: Global Paris, namely the governing of mark-making in public space. (Project notes can be seen here.) Having come to communications by way of art and design, my investigations into things cultural, economic and political are often whetted by encounters with the visual. In Paris, the notice “Défense d’afficher – Loi du 29 juillet 1881” is a familiar sight all over walls, be they private or public, and harkens back to the 3rd Republic, freedom of the press and the Déclaration of human rights after the French Revolution. 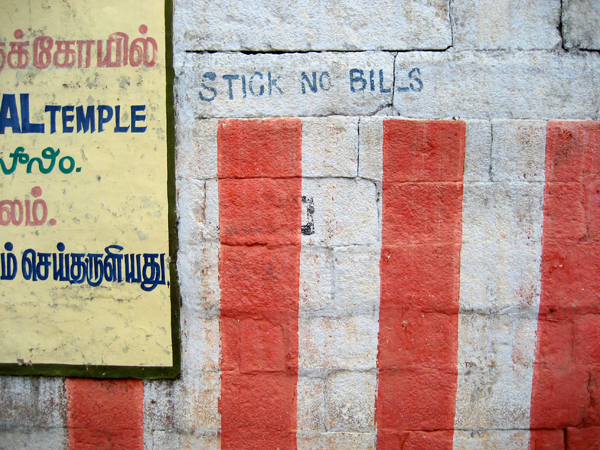 Upon encountering the words “Stick No Bills” in Mamallapuram, I wondered what they might simultaneously be hiding and revealing of Indian visual culture and history. This curiosity set the course for the next few day’s exploration, as I attempted to gain some understanding of how the residents of Tamil Nadu communicate visually in and around the spaces they inhabit. Our drive from Chennai to Mamallapuram and then to Auroville led us through rural areas where it was often difficult to determine where one village ended and the next one began. The roads we travelled were flanked by a patchwork of advertising far more dense than one might see on a typical American road trip. Long rows of roadside kiosks were covered in Vodafone red or DoCoMo brown, indifferent to the fact that few if any of these vendors sell any mobile products at all. Every usable surface of every village shop seemed to have been put to work in the service of marketing, obscuring the buildings themselves and leaving little room for the shops’ distinguishing caracteristics, names or signage. It may be said that, in small villages, shops tend to be distinguished by their owners and their placement, rather than signage. Locals perhaps don’t need signage the way someone arriving there for the first time might. Nevertheless, there seemed to me something predatory about the pervasiveness of the ads, as if the shop owners had become dependent on this form of revenue and advertisers were only too happy to seize the opportunity to dominate the landscape and, in some cases, brand entire villages. Padlock & Key: symbol of the All India United Democratic Front. The tension between private space and advertising is playing out in another interesting way in the villages surrounding Auroville. 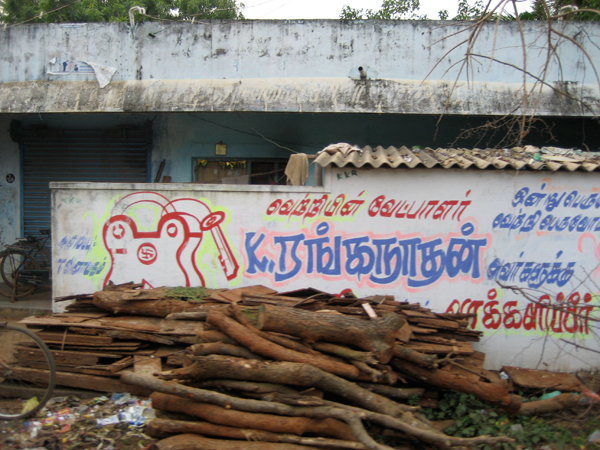 Increasingly, the walls around properties and sometimes those of the houses themselves are painted with text in Tamil and large symbols such as a padlock and key, spectacles, two leaves, a drum, a rising sun or scissors. The sight of the hammer, sickle and star being used in a similar way provided a clue to understanding these messages. The definitive answer came from a large rally held on our fourth night here. Organizers draped a popular intersection in red hammer and sickle flags and filled the air with their amplified voices. These were the signs of electioneering. Indian political parties employ symbols they’ve previously registered with the government, in order to sign their messages and promote themselves. These are different from logos in that their form is not so strictly formalised. They are reproduced by laborers of varying skill levels all over the country, and so the way they are drawn can differ considerably from one application to the next. It is the use of any representation of the object that is protected, and not a specific drawing of it, because what matters is that no other party can use an image of that object once it has been registered, be they scissors, a mango or a bicycle. And once a party gets permission from a property owner to use a wall, the symbol is reproduced as large and as frequently as the surface will allow. At least one town we visited is uneasy with this visual takeover. 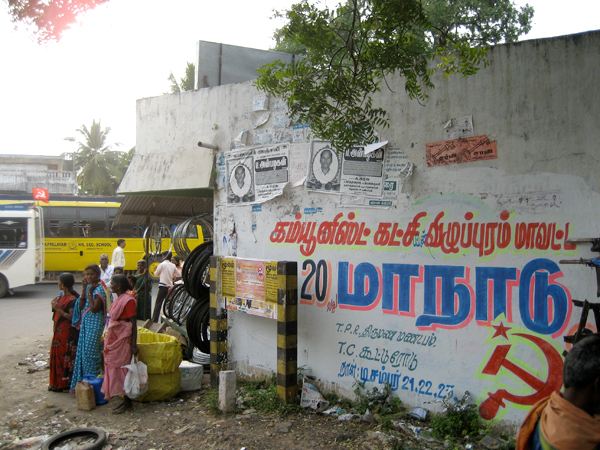 Balu, an organizer at the Mohanam Cultural Center located in Sanjeevi Nagar village expressed concerns over the practice of political parties buying their way into the town’s public sphere. He advocates for an alternative that would involve the local crafts people in a project to repaint the entire village in a way that communicates its traditions and creative practices. For his idea to be successful, Balu will have his own form of campaigning to do. He will have to compete directly with the financial incentives offered by the political parties, and convince his community that their walls have another kind of value altogether. 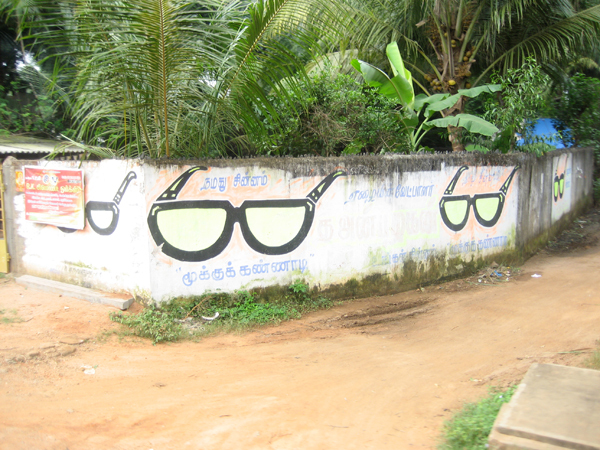 Spectacles: symbol of the India National Lok Dal party. 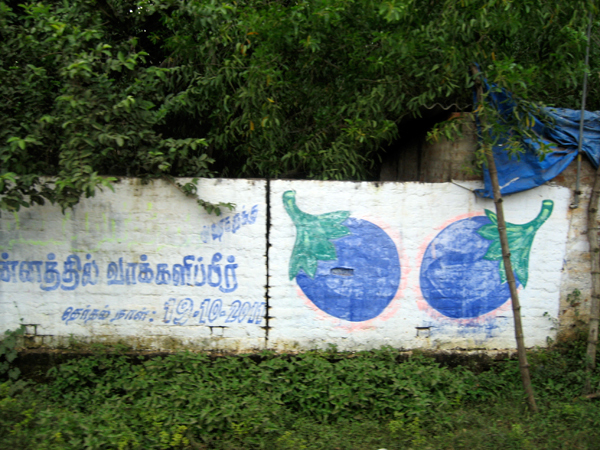 Eggplant: symbol of an unregistered local party, according to Lakshmi, a villager. Hammer, Sickle & Star: symbol of the Communist Party of India (Marxist).